#3 "Monsters of Magasta, The Poisonthorn Forest"
A licensed fanzine for Glorantha, which covers both the 2nd Age and 3rd Age of Glorantha. Both d100 (RQ2/RQ3, MRQ, BRP) and HeroQuest systems supported. 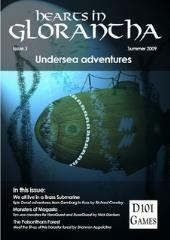 Aims to produce a diverse set of articles in each issue, written by fans old and new of the setting. The emphasis being on material usable in game.